ROAD TOWN, Tortola, VI – Representatives of BVI Electricity Corporation (BVIEC) and Delta Petroleum Caribbean Limited today, August 31, 2012 inked the contracts that would officially seal the tender awarded to Delta Petroleum for the provision of diesel fuel and gasoline, as first reported by this news site. The signing was held in the conference room of the BVIEC in Long Bush earlier today. Delta was awarded the contract for the supply of diesel fuel to all generating facilities in Long Bush, Pockwood Pond and Anegada, and also for the supply of gasoline for BVIEC’s vehicle fleet on Tortola and Virgin Gorda. Regional General Manager of Delta Petroleum, Bevis Sylvester, noted that Delta was started some twenty-seven years ago with the aim of breaking the existing fuel monopoly in place and saving the BVI and the company continues to do just that. Sylvester expressed his happiness with the company being awarded the contract saying that it was cherished. He also declared that this was as a result of teamwork; “without a team we can do nothing…. I am just as weak as anything else, if I don’t have a great team,” he said. He told the media that there were not much changes to the previous contract even though he had expressed the need for including some positive changes, but was advised against doing so. Responding to a question posed by a member of the media regarding what Delta may be doing differently to the SOL in receiving the award for the fourth consecutive time, BVIEC head, Mr Abraham said that guarantees offered in line with the requested specifications of the tender in addition to Delta being able to provide the most economical option with respect to fuel were important factors in making the decision. Abraham related that this part of the world was not immune to changing world trends in fluctuating oil prices and this played a crucial role in the decision of awarding the tender contract to Delta. “Gone are the days when you can go to the gas station and fill up your vehicle with $20,” he remarked. “I don’t think those days will ever return”. 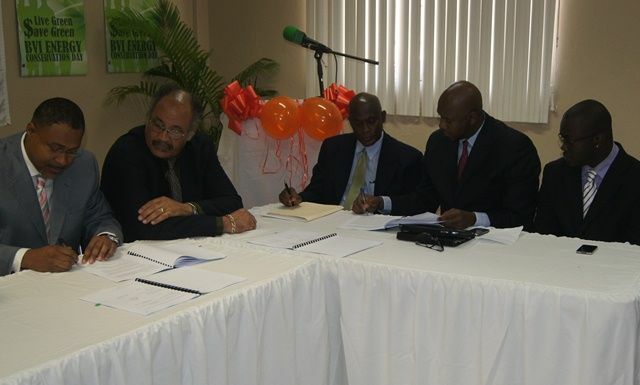 Following a meeting held on August 23rd, 2012 by the British Virgin Islands Electricity Corporation's (BVIEC) Board, Delta Petroleum was awarded the contract for the supply of fuel for two years. This year three companies, Huntum’s Ghut Service, Delta Petroleum and Sol had put forward bids for the supply of gasoline, diesel and lubricants. For the supply of gasoline, the Huntum's Ghut Service submitted a bid totalling $270,000; Delta, $245,232; and Sol, $283,180. Sol and Delta were the only two which submitted bids for the supply of diesel and lubricants. Sol's bid in this area totalled $79,178,691.20, while Delta's bid totalled $76,858,669.50 of which $997,985 was for lubricants. The contract will run from September 1st, 2012 to August 31st, 2014. Last year, the BVIEC inked a $65M contract with Delta Petroleum for the supply and delivery of low sulphur diesel fuel/premium gasoline for the period September 1, 2010 to August 31, 2012. Previously, the BVI Electricity Corporation (BVIEC) had opened bids for the three organizations on Monday, August 13, 2012. This was done at the O’Neal Webster’s conference room at the Simmonds Building in Road Town. Country Manager of SOL BVI, Ms Deborah Benjamin, had told this news site when asked about the tender process that, “We have been a part of the tendering process already and we’re confident that we put in a very good submission as we’ve always had and we will await the outcome of the evaluation of the Board of the BVI Electricity Corporation”. She added that, “We’re confident that we submitted something in line with what we’re comfortable with and with the quality that we always provided to the public”. Current contracts with Delta and SOL are set to expire today, August 31, 2012.